find a way to reel me back in. 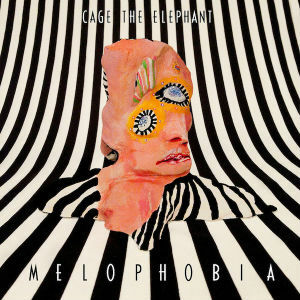 The rate at which Cage have progressed in terms of maturity and sophistication over the course of three albums is astonishing; in an interview with a vlogger, lead singer Matt Schulz said (on Melophobia) “I don’t know if we’ve found our voice, but I definitely think we’ve found some elements that are very important to unlocking creativity.” At another point in the interview, the topic of the identity of the band is brought up, it is pointed out that after three albums the band doesn’t entirely feel confident that they themselves know who they are, and what their voice is. This highlights Cage’s speedy advance in maturity, as after one or two albums the following and media of any ordinary band would typically feel that their identity is firmly in place. Typically, after one record, a band rises to the surface and they’ve found their voice, perhaps it is tweaked by the second; but Cage display a range of different voices that doesn’t fully portray their true voice after their third. Matt Schulz said Melophobia is the fear of music. Putting aside the fact that it isn’t officially recognised as a word, what thoughts are being provoked, and how are they represented? This isn’t a soothing album that you’d listen to after a long day, much of it is hard on the ear, certainly not easy-listening. Opening track Spiderhead paints a punchy, vigorous image of a state of mind in distress. “Either I’m in heaven, or I’m in hell, Am I losing my mind, yeah, (‘Cause I can’t tell) I’ve been waiting for answers for way too long, Seems I’m always waiting around,” it’s a mind in a state of an adolescent-like conflict that doesn’t know what it wants or feels most confident with. The Cigarette Daydreams video is another example of how far Cage have matured, take In One Ear from the début self-titled album, ‘childish’ or ‘immature’ would be harsh, but it’s quite honestly something I could have directed at eleven or twelve years old. However, Cigarette Daydreams is (slightly overly-artsy) evidence proving their progression; it is a real story that complements the song made up of beautiful images, and if one were to pause the video at almost any point in the song, a dramatic frame is produced. The below album cover is a representation of a confused and disturbed mind, one that perhaps has a fear of music, and has a likeness to the one I described before that is portrayed in Spiderhead. Above is a loving description of a girl, the rest of the song and its video describes what happens to the relationship between the singer and that girl, and what role cigarettes plays in it. The second part of that lyric leaves the reader to fill in the holes, we don’t know exactly what happened when she was seventeen, but it wasn’t sweet like she was, until this happened and she grew into a new identity. In the video this female character is starkly seen, literally, burning herself. Towards the end, she sets fire to a body in a car boot, which is clearly her own- she has found a new identity and viciously destroys the memory of her previous self. Track no.7, Black Widow, is similar to Cigarette Daydreams in the sense that it vividly describes a girl whilst leaving gaps for the listener’s imagination to fill. I’d like to focus on ‘this abuse’, one of those gaps left for the listener to fondle with that could mean a range of different emotions and explain different backgrounds, could Schulz be explaining this girl’s sensual movements and what he feels when he sees her? Later on in the song he calls himself an animal, because he is so easily moved by the presence she possesses, so that leads us to one conclusion as to why she’s abusing him; she doesn’t give him any freedom when she walks in to the room and he can’t control himself, he is wholly controlled by her presence when they are in the same room. The term ‘Black Widow’ means someone who portrays the relationship between themselves and their spouse as something else, to make the spouse appear harmful or spiteful, which is portrayed in the song with the punchy brass and explosive ornaments. Musically, Black Widow epitomises the whole album, a wide range of techniques and colours are explored and follows a polyphonic style. Schulz’s voice is also expressed to its fullest, displaying falsetto in parts whilst caressing the track in other parts with his deeper, mellow undertones. It puts a rich, majestic biblical twist on the track, and album on the whole; bass guitar accompanies those lyrics, which emphasises the purity of that message. This message isn’t pleasant, however, because even though it mentions people singing by the sunrise, they are not together: they are alone, perhaps it is a prophetical warning of how detrimental it can be when one thinks irrationally and does not look at situations with a range of perspective, hence the lyric “come a little closer then you’ll see”.